How would you like a free limited release New Teen Titans comic done by Marv Wolfman and George Perez? Or how about one scripted by Peter David featuring Spider-Man, Daredevil and Venom? Well now you can have all that and more, thanks to Richard Graham at the University of Nebraska-Lincoln, whose online library of 183 U.S government commissioned comic books, are available as free pdf downloads. 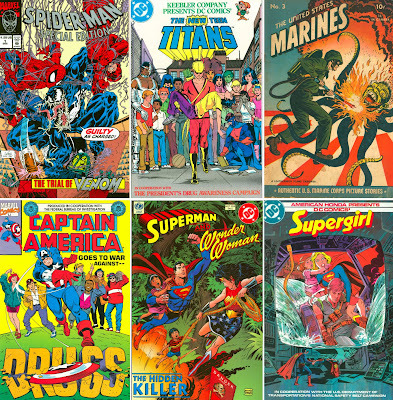 Supergirl, Wonder Woman, Cap, Charlie Brown, Dennis the Menace, Li'l Abner and more, star in a range of titles designed to educate and inform the general public on everything from land mines and drugs, to inflation and how to operate and maintain your M16A1 Rifle. Featuring rare work by the likes of Walt Kelly, Dr. Seuss and Will Eisner, part of the charm of these books are the ads contained inside, especially where the heroes break the fourth wall and address the reader on the issue at hand. The stories themselves are often surprisingly better than you'd think, and for the price tag involved make for a fun read in that rare bit of holiday downtime. To check the range out for yourself, visit Richard's website here. I've always thought a series of comics, starring Aquaman and talking about Global Climate Change, would be a real winner. Thanks Rob! Yeah I thought that was an idea too - even more surprising to me was that the 'dealing with prejudice' books didn't use the X-Men. I thought that would have been a no-brainer.